With their up to 6 1/4 inch (15.9 cm) wingspans, Giant Swallowtail (Papilio cresphontes) butterflies are some of the largest butterflies found here in North America. 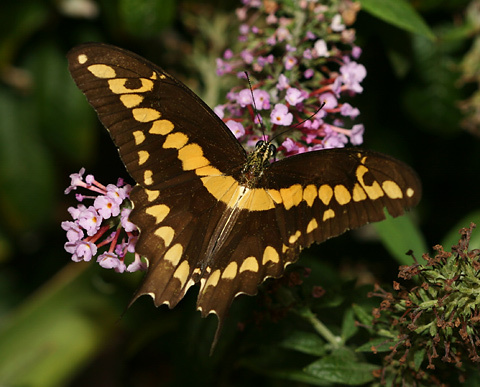 Giant Swallowtails can be recognized not only by their large size, but also by the "tail" on each hindwing, their blackish brown dorsal wing surfaces and more yellowish ventral wing surfaces, and by the two slightly irregular rows of yellow spots that merge before the tips of the forewings. The third yellow spot from the tip of the forewing has an off-center dark brown spot inside it, giving it a lopsided cutout appearance. 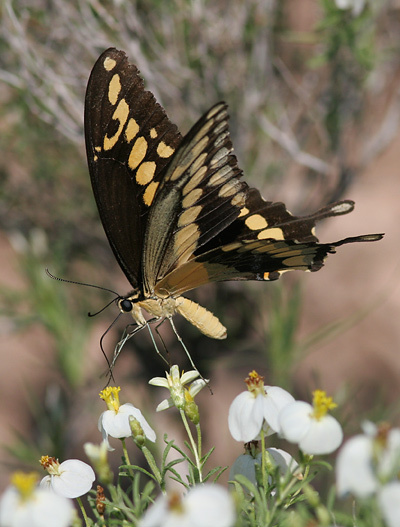 The similar Ornythion Swallowtail (Papilio ornythion) is only occasional here in Arizona and has two non-merging rows of yellow spots, while the Thoas Swallowtail (Papilio thoas) has a very neat row of somewhat squared yellow spots on its forewings. Giant Swallowtails range from parts of Canada down to Central and South America. They are fairly common here in southern Arizona, especially in suburban areas where the nectar-feeding adults can find plenty of garden flowers and also citrus trees (Citrus spp. ), one of their larval food plants. This Giant Swallowtail above was one of the many butterflies visiting my cultivated Orange Eye Butterflybush (Buddleja davidii). Giant Swallowtails also appreciate our many wildflowers here in the Sonoran Desert, and I spotted this Giant Swallowtail below on some of our native Desert Zinnias (Zinnia acerosa) in August of 2007. Our summer monsoon rains give us a summer wildflower season, and butterflies of all sorts are especially common here at this time of year. Summer is also the time that I often find Giant Swallowtail caterpillars on my citrus trees. Since they feed on the leaves of plants in the Rue Family (Rutaceae), which includes citrus trees like oranges, Giant Swallowtail caterpillars are commonly known as "Orangedogs". 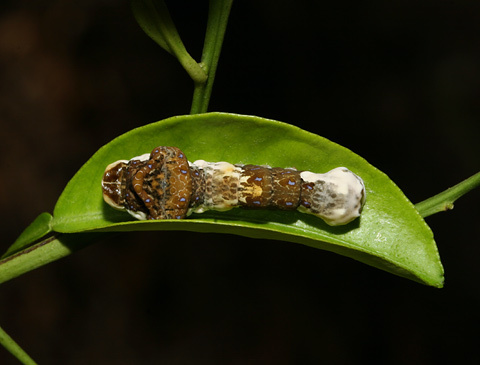 Although these caterpillars can be a real pest if they become too numerous or are feeding on the leaves of small, weak, or young trees, most large, mature citrus trees can afford to lose a few leaves to Giant Swallowtail caterpillars, especially since these caterpillars turn into such majestic butterflies. Unlike the adults, Giant Swallowtail caterpillars are not in the least majestic-looking, in fact, they look very much like big, fat bird droppings as they rest motionless on the tops of leaves. Their bird dropping-like appearance is a form of camouflage to protect the Giant Swallowtail caterpillars from hungry birds, one of their main predators. However, these odd-looking caterpillars also have another defense against predators should their camouflage fail. 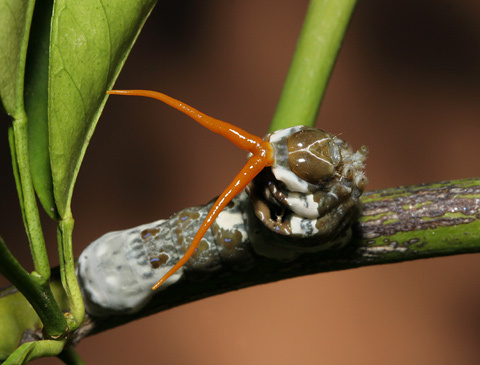 If touched (such as by a curious human), Giant Swallowtail caterpillars will suddenly rear up and evert the orange, horn-like, V-shaped osmeterium (scent organ) on their head. The osmeterium emits a disgusting, nose-wrinkling, ammonia-like odor that could definitely help dissuade any hungry predator not already put off by the caterpillar's unappetizing appearance.